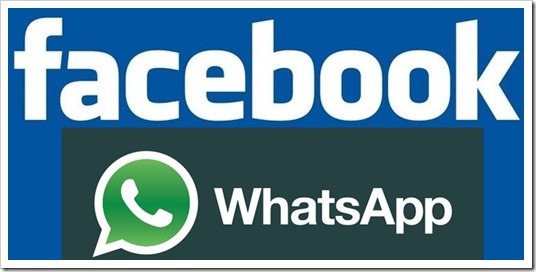 In a surprising move (or probably not so surprising), Facebook has bought Whatsapp for $16 billion. Facebook will pay around $4 billion in cash and the rest of the sum in Facebook shares. Whatsapp is supposed to work independently inside facebook, not unlike Instagram. Whatsapp CEO and co-founder Jan Koum will join Facebook’s Board of Directors. Also, over the span of four years, facebook will give Whatsapp employees and founders an additional $3 billion making the total purchase price $19 billion. This deal, in my personal opinion is because Whatsapp was probably growing too big for Facebook’s comfort. It is a strategic acquisition, as Facebook perceived them to be a major threat… and hence such big bucks! The social messaging app Whatsapp is hugely popular owing to the fact that it acts as a substitute for messages. Where traditional messaging service is costly and has limitations to multimedia that can be handled by it, Whatsapp can be used to send texts, pictures, videos and everything in between by the internet connection via mobile internet or WiFi. Whatsapp has observed tremendous growth over the years and now boasts of over 450 million users. Ironically, Whatsapp has only 55 employees and at a valuation of $19 billion, facebook is paying around $42 per user to Whatsapp. Also, in case the deal fails, Facebook will pay Whatsapp $1 billion as the breakup fees. So, in all, at worst, Whatsapp gets a billion dollars out of this venture. The most interesting thing to observe is going to be the changes that Whatsapp might have due to this. Jan Koum has been pretty clear that he is not a supporter of ads in Whatsapp whereas Facebook’s primary revenue source are ads. While Whatsapp is currently working independently, this is bound to come up at some point, possibly creating friction. At this price, Facebook certainly is showing how important mobile arena is for them and how much they are willing to pay to get any competition out of the way (or maybe the correct word is ‘in the team’). Earlier they had bought a rival photosharing app Instagram for $1 billion. Google bought Motorola for $12.5 billion. Google sold Motorola (hardware division) for $2.91 billion. Microsoft bought Nokia for $7.17 billion. It is hard to imagine that Facebook has considered Whatsapp almost as valuable as both Motorola ($12.5 billion) and Nokia ($7.17 billion) combined. Also, Google sold Motorola’s hardware division for pennies in comparison telling us the importance information holds right now. Facebook’s valuation of Whatsapp also tells us how much important users are from the companies perspective. Only time will tell whether it was a beneficial deal for both the companies. For now though, it will turn heads and will give Google a few concerned nights. I gues the only reason for this acquisition is Facebook’s desire to make it big even on the Mobile platform, which it has not been able to do apparantly. FB had recently offerred $3Bn to snapchat as well. You start your story with “In a surprising turn of events” What are these events?